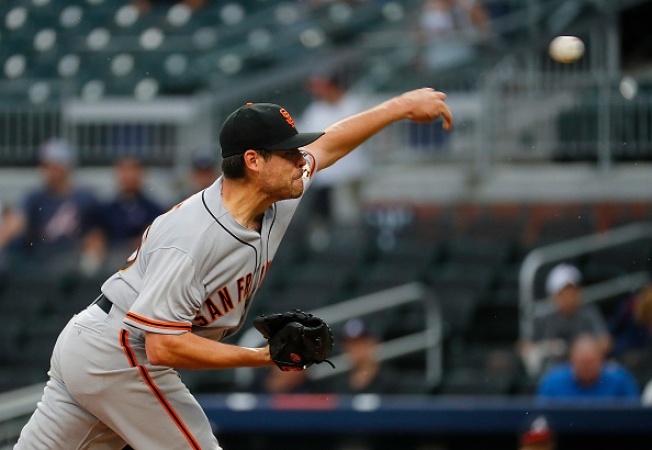 SAN FRANCISCO — The Giants have been talking for weeks about how they aren’t catching breaks. They got a huge one in the eighth inning Tuesday, and they didn’t waste it. Moments after Dansby Swanson dropped a potential double-play ball, Austin Slater hit an opposite-field three-run homer to give the Giants a lead that held up this time. They beat the Braves 6-3, snapping a seven-game losing streak. Josh Osich and Sam Dyson got big outs in the eighth with the tying run on second and Mark Melancon put Denver behind him, closing it out. —- Matt Moore entered with a 9.24 ERA on the road, the highest in the majors. He was charged with three earned runs in seven innings, which qualifies as his second-best road outing of the year. —- The hardest-hit ball of the night was Brandon Belt’s 108-mph line drive that went 390 feet. It was caught in deep center. Per Baseball Savant, the ball had an 84 percent chance of being a hit. The BABIP Gods are cruel to Belt on the road, too, so he was definitely owed when he hit a grounder to second with a runner on in the eighth. Swanson dropped the throw as he tagged short and the Giants successfully challenged. A batter later, Slater happened. Belt then homered in the top of the ninth, adding a big insurance run. —- Buster Posey was 0 for 4 after opening the season by reaching base in 37 consecutive road games. He finished 21 games short of the franchise and NL record, held by Barry Bonds, of course. —- Hunter Pence misplayed a fly ball to right, turning it into a double and putting two in scoring position. Moore got out of the inning, but this continues to be a problem. It wasn’t just a Coors Field-air thing. —- Apparently The Freeze is not a mudder. He did not race Tuesday night.